A unique combination of marine silicone and polyurethane formulated especially for fiberglass. 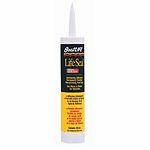 LifeSeal offers a fast-curing, low odor, high adhesion, non-sagging, non-corrosive, non-yellowing formula. Custom colors available. Mildew resistant.